Kathak (Hindi: कथक), one of the eight forms of Indian classical dances, originated from India, traces its origins to the nomadic bards of ancient northern India, known as Kathakars or storytellers. Its form today contains traces of temple and ritual dances, and the influence of the bhakti movement. From the 16th century onwards it absorbed certain features of Persian dance and central Asian dance which were imported by the royal courts of the Mughal era. In Quotes. Narthaki.com. Retrieved on 17 January 2014. One of the eight forms of India's classical dances, Kathak, meaning “story teller,” originated in northern India, and there are references to this dance form in sources dating from the third and fourth centuries B.C. 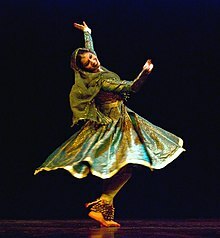 Kathak dance, today characterized by fast, rhythmic footwork, became sophisticated court entertainment with the advent of Mogul culture in northern India. Natya Shastra was the root for both Bharata Natyam and Kathak, and both are of the same period. Kathak, which flourished in the North, was in the direct eye of the typhoon of invasions. Lavina Melwani in "Maya Rao: Grand Dame of Kathak". Hinduism Today. Retrieved on 17 January 2014. Maya Rao in "Maya Rao: Grand Dame of Kathak"
By Chencho Sherin Thomas in "Kathak has a Flexible Language". New Indian express. 4 December 2013. Retrieved on 17 January 2014. By Chencho Sherin Thomas in "Kathak has a Flexible Language." Kathak has a very flexible language when compared to other classical dance forms. Due to its similarities with Spanish Flamenco dance, there are many who believe that Flamenco has been originated in India. Kathak the term was derived from ‘kathakar’ (story teller) who used to narrate vignettes from Ramayana and Mahabharatha at Hindu temples. Later on, Kathak moved to courts because of Muslim invasions. Girls from Persia(courtesans) were brought in and they performed Kathak before the Mogul kings. By Shila Mehta quoted in "Kathak has a Flexible Language." Nidhi Purohit in Kathak faces fusion challenge. Times of India (19 October 2013). Retrieved on 16 January 2014. Dance styles depend on the sociological background of the people who first started practising them. Take Kathak, for example. It was with the Muslim invasion that Hindustani classical music received prominence. They brought with them the tawaifs, who, along with the existing kathakas or storytellers, gave Kathak its flavour. And then, Kathak went into the darbari mode. Post that, elements of raas leela started being incorporated into Kathak, which is now, a versatile product of these influences. The dance style has not changed but with less time and more work, the duration has decreased,"
Dance is the best yoga. Yoga is all about maintaining the concentration and finding a balance, that is exactly what we do while we dance Kathak. It's always about concentrating on 'talas' and 'w:laya:layas' and catching smallest of beats. After years that I have put behind my art, I have achieved a fine tuned balance that goes much deeper than making me able to handle my art form well. Birju Maharaj in "Dance is the best yoga: Birju Maharaj". Times of India. 16 January 2012. Retrieved on 17 January 2014. Raigarh Darbar, an elite form of Kathak, encompasses the best of Kathak styles of Jaipur and Lucknow gharana. Raigarh gharana although new, has its own compositions of thumris, ghazals, todas and bols which are unique in themselves. In Kathak fusion leaves audience mesmerized. The Hindu (28 October 2013). Retrieved on 16 January 2014. In the Hindu period the dancers used to wear ghagras or saris. At the Muslim court they had to adopt the durbar dress, which was the Peshwaz worn over churidhars, seen in the Moghal paintings. The costume changes have over the years been adopted by kathak dancers, mainly because the peshwaz is more comfortable and also allows viewers to see the intricate footwork which gets obstructed by saris and long ghagras. Rao uses all three costumes for her dancers-saris, ghagra-sari and the peshwaz. ...I take Kathak as an example, is that we are living in a very different kind of world from when Kathak first took shape and the needs of our present society are ever changing. There is a whole new generation of Indians who belong to an international and cosmopolitan community. The world is closing in on us, so to speak, and just as people from different cultures and religions are interrelating through technology, migration, hitech communication, dance also wants to be involved in this process. We are no longer living in the temples or courts; hence we must make a great leap into the international arena of dance. On introducing choreography into classical dance by Kumudini Lakhia in Choreography In The Indian Context. Narthaki.com (15 December 2001). Choreography, as understood today, requires the dance form to be put into a different kind of space. This requires a new approach of the known structures to suit new concepts. It is simply safer to keep looking over your shoulder for material from the past rather than facing the vast, open plain before you. We must come out of this safe corner and have the courage to confront this thing called creation. Kumudini Lakhia in "Choreography In The Indian Context". Solo Kathak dance did not excite me any more because it had developed too much gimmickry to it. However, I was deeply rooted in dance and the technique of Kathak itself was very artistic and complete. The way it was presented needed a lot of consideration. A performance needs to embody a certain dignity and finesse. This was my very first commitment to the presentation of Kathak. In my vision, I saw the entire stage filled with dancers, patterns of colours, music which had musicality and not just an accompanying element.